Frontispiece: Leonardo is fighting a horde of Foot Ninja while simultaneously dodging arrow fire. He recalls how Splinter taught him about actions and reactions and relates it to his own life. His acts of vengeance upon the Foot have trapped him in a web of retaliation and he ponders how long it will take to escape, or if he’ll even escape at all. Following Hun’s attack on the Jones family, Casey, April and Shadow have gone into hiding at the Northampton farmhouse. At the news offices of The Bullet, the editor (Charles Pennington) is chewing out his journalist, Lauren Stanton. Her investigation into the recent precinct fire and its ties to an organized crime syndicate called the Foot Clan as well as with corrupt police officers, has been getting her and her editor into a whole lot of trouble (the death threat kind). Much to Lauren’s chagrin, she is reassigned to cover the recent release of Hunter ‘Hun’ Mason. Lauren storms out and throws a tantrum, horrifying all in her path. After settling into her cubicle, she’s approached by her buddy, Stan, who has some photos to deliver. They were taken from the precinct fire, showcasing Lin, Foot Ninja and several awkwardly shaped “people” in heavy, concealing clothing. Now off the story, Lauren casts them aside as useless and focuses on her new project. She asks Stan to help her dig up some info on Hun, and after a little bit of browsing on the computer, he comes up with a photo of Hun taken at the Snake Pitt Club in Harlem. Lauren decides to infiltrate the club, but Stan warns her it’s a death wish, as the place is owned by a guy named King Cobra, and he’s bad news (he could’ve just said “White girl in Harlem after dark” and made the same point, though). Naturally, Lauren goes anyway. Lauren arrives at the Snake Pitt all dolled up and is let in, no questions asked. She cases the joint, noticing corrupt cops, like Simon Lord and Steven Welsh, bumping shoulders with known thugs, like Big Little and his homies. Unknown to her, King Cobra is watching her every move. She eventually spots Hun and sneaks into the back access hallways. In the kitchen, a business deal between the Foot Loyalists, represented by Lin, and the Purple Dragons, represented by Hun, is going down. Lin regrets that her boss could not greet Hun in-person, while Hun ponders why Lin even bothered to help him get out of jail in the first place. Amid such discussions is talk about a weapons shipment showing up tomorrow night for pick-up at a “meat place” down by the docks. Lauren snaps a photo with her camera-phone, but bumps into a mop and bucket on the way out. She’s caught and dragged out into the alley to explain herself to King Cobra. The snake-faced villain IDs her, leaving Hun to order her execution. As the head honchos leave, the thugs move in for the kill. Suddenly, the Turtles arrive! As they beat some sense into the hoods, Mikey drags Lauren away some place safe (a rooftop), then rejoins the fray. Back at the office, Lauren finds most of the photo files on her camera to have been corrupted. One works, however, and she instantly recognizes Lin from the photos she’d taken at the precinct fire. Lauren spills the beans to Stan, realizing that the precinct fire and the business with Hun are all related. She and Stan then embark on multiple fact-finding missions. Lauren attempts to interview Detective Paul Whitmire about the strange “creatures” seen at the precinct fire, but gets nowhere. 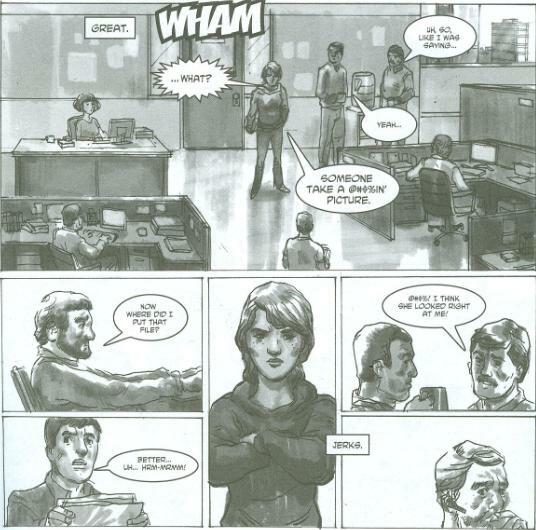 His reaction, combined with the fact that “four giant turtles” are mentioned nowhere in the unregistered superhero files of the city, leaves her to realize that they’re being protected by Whitmire. Meanwhile, Stan hunts down all the info on Lin Koyobashi, enlightening Lauren on her connection to the Foot Clan. Lauren then heads out to Don’s Meat Packing Plant down by the docks to watch the arms deal go down. She gets more than she bargained for, as the Turtles once again arrive on the scene. As Leo, Don and Raph take on the thugs, Mike carries Lauren to safety yet again. He commandeers her camera-phone and sends her away, leaving her with nothing to show for her struggles. Back at the office, Stan delivers a package to Lauren. It contains her camera, sans photographs, and a note. Mikey regrets having to take her pictures but wishes her the best. Lauren is intrigued. *This story is continued from Tales of the TMNT (Vol. 2) #56. *This story is continued in Tales of the TMNT (Vol. 2) #61. 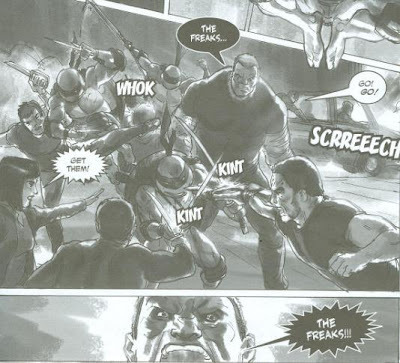 *The Precinct fire and all the events there-in happened in Tales of the TMNT (Vol. 2) #36, the first part of this story arc. 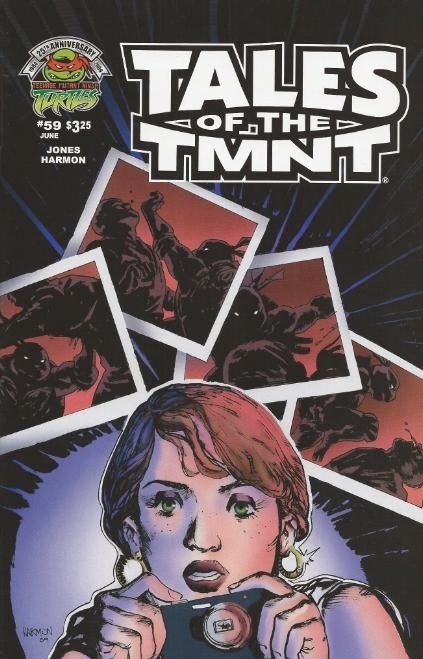 *Lauren's editor, Charles Pennington, originally appeared in "Teenage Mutant Ninja Turtles the Movie" as April's boss. Gotta love them Easter eggs. *This issue also featured a bonus pin-up, “Samhain Showdown”, by Fernando Leon Gonzalez and Ryan Brown. Jones and Harmon are at it again! Their hardboiled take on the Ninja Turtles universe continues onward at breakneck speed with this latest installment in the storyline. I’ve read varying levels of reception for this grittier take on the TMNT universe, though even those that don’t particularly care for it don’t seem to outwardly hate it, with the majority of feedback being pretty positive. Those who aren’t this storyline’s biggest fans may be pleased even less with this installment, due to it focusing primarily on human characters instead of the Turtles, but those who have been adoring the saga, well, you’re in for a treat. If the summary didn’t spell it out for you, this story is told from the perspective of Lauren, giving us an outsider’s point of view on all this craziness. While true, she does spend much of the issue uncovering facts we, as readers, have long been well aware of, she also manages to unearth lots of tidbits that are news even to us. Because hey, she’s a journalist. That’s what they’re paid for. It’s paced out quite well, with some very snappy dialogue that helps you fall-in with the character, adapting to the real-world perspective. That way, when the giant monster turtles with melee weapons start dropping down from the sky on Page 14, you somewhat share in Lauren’s complete “What the @#&*! ?” reaction. Even though we’ve all seen the Turtles a million times before, we’re seeing them for the first time through Lauren’s eyes, and the whole thing’s pulled off rather well. The story is, admittedly, some pretty complicated stuff. This third chapter introduces even more characters to keep track of, and if you haven’t read issues #36 and #56 recently (or god help you, at all), you’re doomed to be lost. 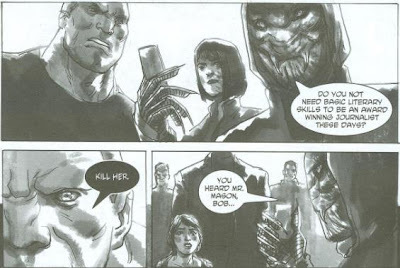 Thankfully, Berger and Jones saw fit to include a refresher course on the storyline in the opening editorial, so as long as you read that, you should get along just fine. And since this issue makes it a point to bring up all the characters and their ties to one-another, the savvier readers out there shouldn’t be left with much to ponder, anyway. While Lin has been running around getting business done since issue #36, Detectives Miller and Whitemire haven’t had much opportunity to make themselves useful since their introduction. I’m hoping they step up as characters in the next installment, as they’re starting to fade into the background a bit. Meanwhile, the new baddy, King Cobra, is given a chance to strut his stuff. His main appeal is primarily a visual one, looking cool as he does with that creepy snake-face (Mask? Mutation? I dunno). He doesn’t really have much effect on this issue’s story outside of owning a nightclub, but he’s gifted with some entertaining lines, so he ranks above a throw-away character. If my grandfather were still alive, I imagine he’d say that Paul Harmon’s artwork is “the bee’s knees”. Though, in retrospect, I don’t think he ever talked like that. The guy fought in, like, nine different wars and only ate what he could kill, so I can’t see those words coming out of his mouth. But I still think he’d like it. Harmon’s dark, gloomy and muddy style suits this type of storytelling like a glove and makes for some serious visual excitement. The fight scenes are up close and brutal, though know when to take a step back in order to remind us we’re watching everything from Lauren’s point of view, not the guys in the middle of the brawl. If I have one quibble, I suppose it’s that I didn’t find Lauren all that attractive-looking. She’s supposed to be able to step right into an exclusive nightclub on her ravishing looks alone, but I just didn’t see it. Tales of the TMNT hasn’t had a lot of multi-issue story arcs to speak of, but of the few we’ve received, this has been turning out to be my favorite. It’s a nice antithesis to the more “Saturday Morning Cartoon”-styled adventures we tend to get saddled with, placing the Turtles in a very real environment with just the right touch of impossible characters and situations to make it all feel right.